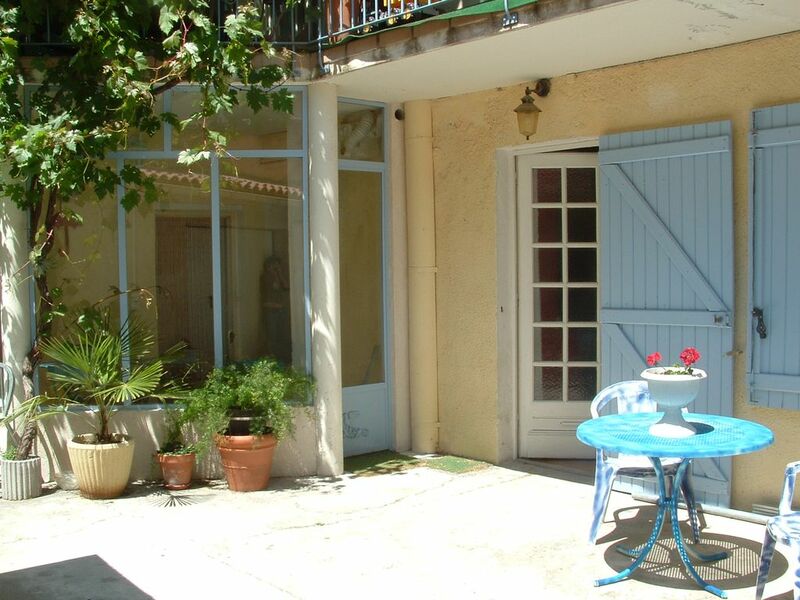 Beautiful south facing apartment on the ground floor of a villa in the Intra Muros d'Avignon. Total surface approximately 48m2: 1 room, a big stay opened on kitchen with 2 sofas among which 1 BZ convertible. 1 conservatory winter garden of about 7 m2. All overlooking the flowery courtyard of about 50 m2 very sunny, with garden furniture provided. The apartment is accessible to people with reduced mobility (but undeveloped). Possibility of parking in the course. Bed sheets and towels included. Total capacity 4 people, possibility to provide cot. Avignon is less than an hour by car from the Camargue, where you can enjoy the sea and the fabulous landscapes of Camargue, horses, fauna and flora of the marshes. 30 minutes away is the most beautiful sites in Provence with the possibility of swimming in the river: the Pont du Gard, the cascades of Sautadet, Gorde, Rousillon, Saint Remy de Provence, the Baux de Provence and many others. Beautiful excursions in perspective. We had a wonderful weeks holiday in the apartment.The location was ideal and we had everything we needed there to make our stay perfect.The owner was really friendly and could not do enough for us.We will definitely be returning,hopefully next summer. "On a three-month tour of Europe, we decided enroute to do a four-week stopover in Avignon. The accommodations, nestled within the ramparts of the old city, were exactly as advertised and entirely met our needs. From start to finish, our hostess Emmanuelle was unfailingly helpful and obliging. Avignon is a wonderful town to explore and a terrific base from which to explore Provence and the Côte d''Azur (French Riviera). At the end of a busy day, it was always a pleasure to return to our pied á terre at 19 Rue de l''Amouyer." "We spent a wonderful 2 weeks in Avignon. The apartment had everything we needed and was close to lots of nice restaurants. We would definitely stay there again!" "The property was very nice, clean and attractive. The surroundings were quiet - there was a nice courtyard with table outside the appartment. It was easy to find and a short walking distance to Avignon's tourist attractions". "My partner and I stayed at this apartment for a week in August 2010. We had a great time in beautiful Avignon and the apartment was a perfect base to explore the city and the surrounding area. It's in a very convenient location, within a 10 minute walk of the centre of town, and there are lots of bars and shops nearby. The apartment itself was a really good size and was perfect for a couple or a family of three - I wouldn't recommend having more than two or three people staying there as it would be cramped. There was no traffic noise from the roads as they are very small. There was a small amount of noise from the surrounding houses during the day as there are many children living in the street, but it was always silent at night. In Avignon we would strongly recommend the restaurants L'Entree des Artistes on the Place de Carmes and La Vache a Carreaux in the town centre. There is a fantastic wine bar called Chez Marie on the Rue de la Carretiere, very close to the flat, where you can get a really good glass of wine for 2 euros and sit in their lovely bar. All in all, we would liek to thank the owners for providing a perfect base for a brilliant holiday." "the host is very nice and sweet"